In a nonstick pan over medium heat, warm the walnuts, shaking the pan back and forth, for a few minutes, until the walnuts are lightly toasted. Set aside. Set a medium saucepan filled with water over high heat and bring to a boil. While the water is coming to a boil, make the spinach topping: In a large, deep skillet or wide pot, heat 2 tablespoons of olive oil over medium heat. Add the garlic cloves and stir for a few minutes until soft, careful not to burn the garlic. Add the spinach, raise the heat, and stir until the spinach wilts. Drain the spinach and place in a serving bowl. Add salt to the boiling water, then add the gnocchi. As the gnocchi rise to the top, remove them with a slotted spoon and add to the bowl where you’ve put the spinach. 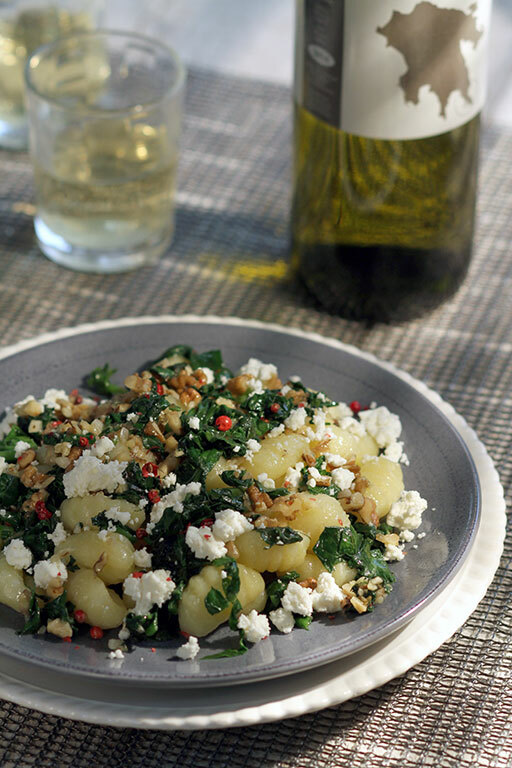 When all the gnocchi are in the bowl, add the feta, walnuts, pink peppercorns and remaining olive oil. Toss gently and serve hot.